Five years ago, after many more years of undiagnosed symptoms, it was finally determined that I was experiencing symptoms of Parkinson’s disease. Looking back, I don’t understand why it took so long for my symptoms to be picked up by my doctors. My wife, who is a registered nurse, knew something was wrong with me. She insisted I get a brain scan to account for difficulties in expressing myself. I had lost my sense of smell, which was ignored. When my family doctor sent me to a neurologist for an onset of hand trembling, it was dismissed as an Essential Tremor, not Parkinson’s disease. Only after my wife insisted on a second opinion for the trembling hand did the diagnosis switch to Parkinson’s. I now understood that I could look forward to a lifetime of physical deterioration. Fortunately everyone didn’t agree with the common belief that the disease is progressively degenerative with no intervention available. 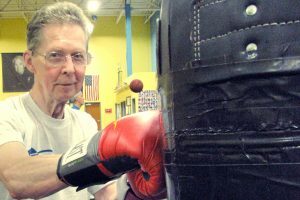 My wife had heard of an innovative approach to improve the lives of Parkinson’s disease patients which was sponsored by Rock Steady Boxing which was in its early years of operation. She tracked them down and I soon was a Rock Steady Boxer-one of the best decisions I have made in my 78 years lifetime. After participating as a boxer for four years, I feel I have not just maintained my physical well-being, but improved my starting conditions. To mention just a few… my stamina has improved, my balance has at least maintained, I am stronger and I can run again. I am especially grateful to the Rock Steady social environment in which boxers are immersed in a friendly pool of people with common interests, understandings, and hopes. I don’t get this kind of support anywhere else. The world is a good place to live in again.